Heroes, Heroines, and History: Hannah Emerson Duston & Book Giveaway! Hannah Emerson Duston & Book Giveaway! Among my husband’s more colorful ancestors is Hannah Emerson Duston, also known as the Hatchet Lady and the Haverhill Hero. March 9, 1696/7. A relative of Hannah’s named Mary Neff, probably her aunt, was acting as her nurse in the days following the birth. 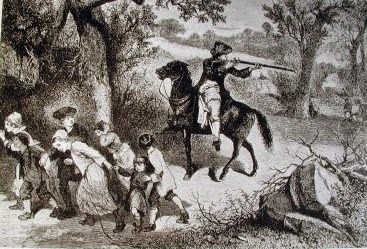 The French encouraged the Indians to raid English settlements during King William’s War (1689–97), and on March 15, 1697, band of Abenaki made such a raid on Haverhill. Twenty-seven women and children were killed in the raid. Less than a week after giving birth, Hannah Duston was captured along with her infant daughter and Mary Neff. Hannah’s husband reportedly tried to persuade her to let him carry her to a safe place. Apparently she felt his energy would be better spent saving the other children and told him to save them. He rode his horse after the fleeing children, determined to save at least one, and fired on the Indians who tried to follow. He managed to escape with all seven to the nearest garrison. The Abenaki gave up the pursuit and turned back to raid the house. Mary Neff had stayed with Hannah. Artist's portrayal of Thomas Duston saving his children. The interlopers burst into the cabin and captured the two women. The baby was brutally killed, being dashed against a tree by one of the Abenaki soon after their march began. 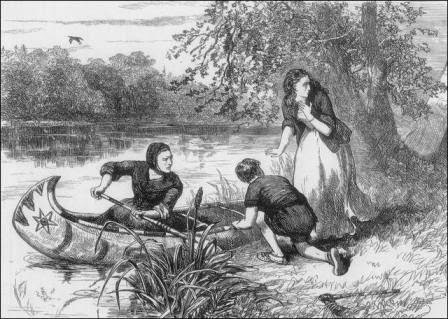 Hannah and Mary were taken northward by their captors. The thirteen captives from Haverhill were divided into smaller parties of Indians, who probably planned to take them to Canada. With Hannah's party was a boy, Samuel Lennerson or Leonardson, about 12 or 13 years old, who had been captured more than a year earlier in another raid. This painting portrays Hannah and Samuel in action. About two weeks after their capture, they had traveled about 100 miles from Haverhill, north of what is now Concord, New Hampshire. The party paused at an island (afterward known as Penacook Island, or Dustin Island) in the confluence of the Merrimack and Contoocook rivers on the evening of March 29. The two women were told that after a short journey to a further village they would be stripped and beaten. During the night, Hannah and the boy Samuel secured hatchets and attacked their captors. Ten were killed, nine of them, most accounts say, by Hannah. 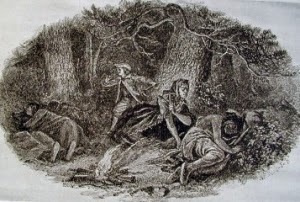 The three captives then used a canoe to escape, but Hannah turned back and scalped the 10 corpses to have proof of the exploit. Scalps could be handed in for a bounty during the war. with an assist from Mary. After facing many hardships, they reached Haverhill safely. They presented their story to the General Court in Boston on April 21, which awarded the sum of 25 English pounds to Hannah Duston and half that to each of her companions. Hannah Duston lived out the rest of her life quietly, moving to Ipswich after the death of her husband in 1732. Mary, Samuel, and Hannah flee the island. 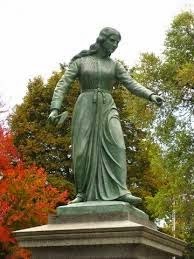 Hannah has been memorialized in two statues of her wielding a hatchet, one in the town of Haverhill, Mass., and the other near the site of her escape in Boscawen, N.H. The monument at Boscawen, N.H. 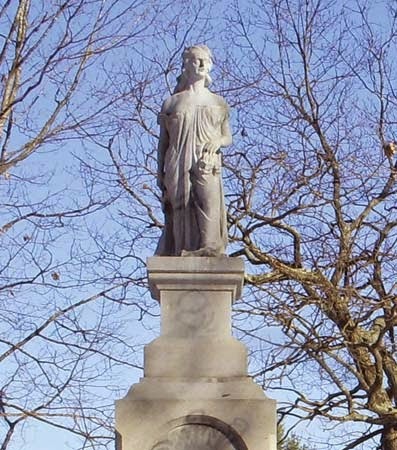 The monument in Haverhill, Mass. Our family happened upon the monument on the island in Boscawen by chance while traveling in New Hampshire. I saw the sign and told my husband to stop. We were near a monument to his ancestor. We took the kids and walked down a shady path and along an old railroad track until we came upon the statue. It seemed an odd, isolated place for such a memorial, but this was the place where Hannah defended herself and made her escape. In recent years, a few people have protested the honor shown to Hannah and tried to cast her as a murderer and have the statues taken down. I have to agree with the people of Haverhill who refused to remove the monuments. Hannah is a heroine. That's some story. Hannah must have had a lot of gumption to survive such an ordeal. I wished I knew tales of my ancestors. I get to claim Hannah because my husband and thus all of our children are her descendants. It's neat to have someone like her in the family tree. My own side has some doozies too, but Jim's family seems to have a lot of them. Would love anyone of these books. Always good to read something new. Wow! Very interesting! 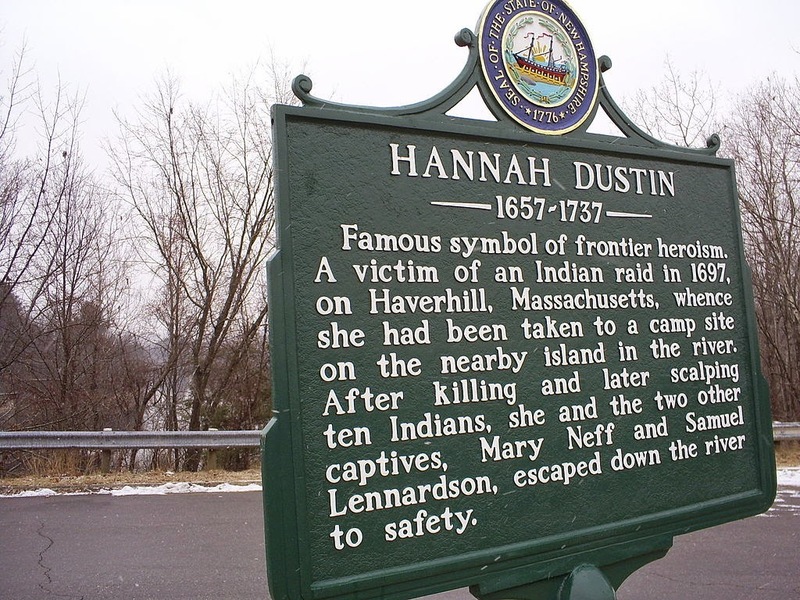 We had a monument in our little VT town where I grew up of an Indian woman, I believe, who was with some explorers. I shall have to look at it again when I go home! Not a relative of mine, but I love those historical monuments. My oldest son claims he stops at every historical monument he sees along the road. He must get that from me! I haven't seen the Haverhill monument in person yet, but we saw the one in NH by chance. We were on our way to a wedding, and I saw the sign. It seemed odd that it was way out in the boonies and off the road and down a path and ... but that's where it happened. Very cool. Thanks, Angela! I know you're also a great history buff. Thanks, Deanna! I'm with you. As a mother, she found the strength to do what she had to in order to get home. Susan, I always love reading your posts. They are so interesting and I thank you for sharing your talent. Thanks, Melanie! Good to see you here again. What a wonderful history lesson. She is indeed a heroine. Thank you for this post and for the chance to win a copy of one of your books. I hate it when historical monuments are removed, as though we could erase history. My niece had a tour in Europe--I think it was in Prague, but maybe another city. Anyway, this tour was of monuments no longer there! Wow. Give the kids time, Chris. They'll come around later. Wow, I cannot imagine going through all that and still having the will to escape by killing your captors. What a strong woman! I know it, Susan! I don't know if I'd be able to do it. This is a timely post for me, having just watched "The Sign of the Beaver". 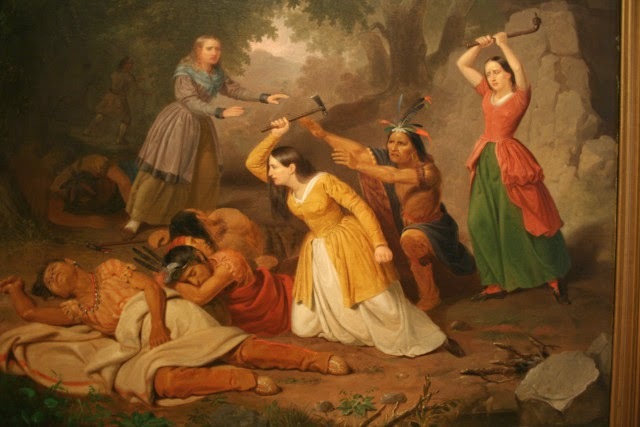 In the movie, the Indians tell a sad tale of how their women and children were murdered by white men; I sympathize with the Indians, but we can't forget that the murder and brutality happened on both sides. Very neat that you have such a strong woman in your ancestry, Susan! Thanks for sharing. Love that book, Linore. As a child I read "His Indian Brother," which is by another author, telling the story of the same family. Being a Maine native, that story was of special interest to me. I only discovered "The Sign of the Beaver" as an adult, when I had children to read to. Very interesting story and it's nice that you have that to tell about your family. And yes, I agree, she is a herione! My uncle was from Ipswich, only in South Dakota, lol. Thank you for the chance to win one of your books, I have enjoyed many of your books. Thanks for taking part, Sharon. This book looks really great! I would be honored and blessed to win any one of the books!!! Thanks so much for the opportunity to win! God Bless You and Your Family! Have a wonderful, blessed day! You're entered, Frances. Thanks for coming by. Terrific post, Susan. Thanks for sharing about this courageous woman. Colourful indeed. Thank you for sharing. Sounds like a great read! This is a new author for me! Glad you came by, Susan. Thanks, Marianne. You're entered! The more I learn about the people of that time period, the more amazed I am. Wow! What a strong woman to go through such an awful trauma and loss of her newborn to come out on top! I don't know that I'd have her strength and courage. I also agree: Hannah is a true heroine and those statues should stay standing! We agree on that! And Hannah wasn't even sure her husband and other children had survived. She was quite a lady. Hannah certainly was a strong, courageous woman! Thank you for sharing this fascinating post, Susan, as well as the chance to win one of your wonderful books! Wow, what fascinating history. As a Mother of 12 children reading this really fascinates me. As women and as mothers we have to do whatever it takes to persevere. I know I would do anything I had to to protect my children. I love historiacal fiction and nonfiction reading as well. I love taking historical trips and checking out monuments and signs. I would absolutely love to read any of these books of your please. Thank you for the opportunity. I'm with you, Deanne--a mother's love is fierce! The winners are Virginia Winfield and susanlulu. Thank you, all who took part! My daughter is named Hannah, in part for Hannah Dustin, and in part because I like palindromes. When Hannah was born we lived in southern NH, now we live in walking distance of the Penacook statue.